A specialist in hydrogeology of frozen zone of the lithosphere. Research interests cover modeling the evolution of frozen rocks and underground hydrosphere in the northern Siberian platform. Alexeev, S.V. (2000). –Cryogenesis of groundwaters and rocks. (2000). – SB RAS, Novosibirsk, 119 pp. (in Russian). Alexeev, S.V. (2009). – Cryohydrogeological systems of Yakutian diamond-bearing province. – GEO, Novosibirsk319 pp. (in Russian). Alexeev, S.V., Vakhromeev, A.G., Kotsupalo, N.P. 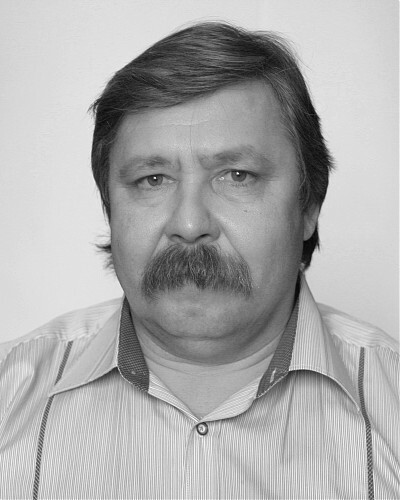 & Ryabtsev, A.D. (2014). – The industrial brines of Siberian platform. –Geographer, Irkutsk, 162 pp. (in Russian). Alexeev, S.V. & Borisov, V.N. (1995). – Technogenic processes in the brine-permafrost system. – Hydrological Science and Technology, 11(1-4), 169-173. Pinneker, E.V. & Alekseew, S.V. (2000). – Grundwasserschutz in Permafrostgebieten. – Grundwasser, 4 (5), 159-169. Alexeev, S.V. & Alexeeva L.P. (2003). – The burial of drainage waters of Udachnaya kimberlite pipe into permafrost . – Permafrost, 1, 1-4. Alexeev, S.V. & Alexeeva, L.P. (2003). – Hydrogeochemistry of the permafrost zone in the central part of the Yakutian diamond-bearing province, Russia. – Hydrogeology Journal, 11(5), 574-581. Alexeev, S.V. & Alexeeva, L.P. (2002). – Ground ice in the sedimentary rocks and kimberlites of Yakutia, Russia . – Permafrost and Periglacial Processes, 13, 53-59. Shouakar-Stash, O., Alexeev, S.V., Frape, S.К., Alexeeva, L.P. & Drimmie, R.J. (2007). – Geochemistry and stable isotopic signatures, including chlorine and bromine isotopes of the deep groundwaters, of the Siberian platform, Russia. – Applied Geochemistry, 22(3), 589-605. Alexeev, S., Arzhannikov, S. & Alexeeva, L. (2007). – The evolution of permafrost in the western part of the Todzha depression, Russia. – Geomorphology, 91(1-2), 124-131. Alexeev, S.V., Alexeeva, L.P. & Kononov, A.M. (2012). – Cryopegs of the Yakutian diamond-bearing province (RUSSIA. – In: Groundwater Quality Sustainability (IAH Selected Papers). – CRC Press/Balkema, 101-107. Alexeev, S.V., Alexeeva, L.P., Kononov, A.M. & Shmarov, G.P. (2013). – New opportunities to effective tailing storage operation (JSC "ALROSA", Russia). – Procedia Earth and Planetary Science, 7, 10-13. Alexeev, S.V., Alexeeva, L.P. & Kononov, A.M. (2014). – Cryogenic deformation structures in Late Cenozoic unconsolidated Ssdiments of the Tunka Depression in the Baikal Rift Zone. – Permafrost and Periglacial Processes, 25(2), 117-126.